Regulation rollbacks haven’t affected them much. Finding people to hire is affecting operations, just like nearly every other industry in the region. The industry remains strong but there are potential danger points. Mark Kross, CEO of Verus Bank of Commerce, said that costs to comply with federal regulations does have an impact on bank rates of return, which have been reduced in the past few years to about 7 percent or 8 percent. And the regulations really haven’t declined, despite the posturing in Washington, D.C.
Byron Bateman, CEO of Cache Bank & Trust, an independent bank in Northern Colorado, said the Washington buzz hasn’t affected the folks in the trenches. “They’ve made a few adjustments, but the pure expense of staying up with these things is still there,” he said. “When I ask, ‘what are you doing to help us compete?’ I get no answer,” he said. 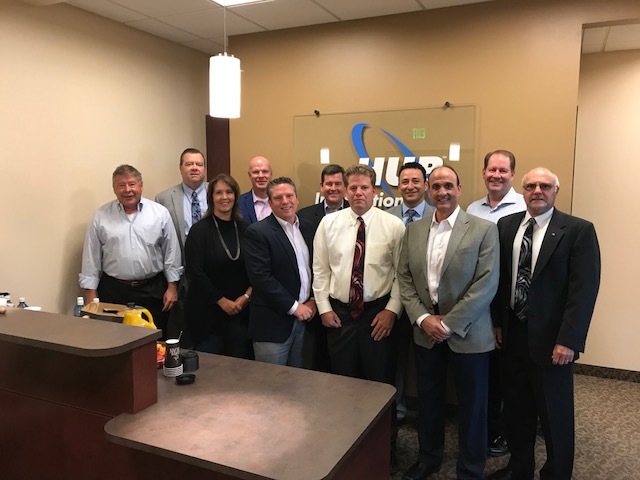 Todd Marksberry, CEO of Canvas Credit Union in Northern Colorado, formerly Public Service Credit Union, agreed that little has changed. “We’re still contending with what the previous administration put in place. It’s fortunate they haven’t added new regulations,” he said. Bateman, with 42 years in the banking business, said some of the regulations are good. “It impedes the multinationals who take advantage of every loophole,” he said. Like virtually every other industry in the region, bankers complained about the inability to find qualified, experienced people to staff their operations. Luis Ramirez, market president and commercial banker with BBVA Compass bank, said his organization would like to hire additional commercial lenders but is having difficulty finding the right people. “We’re all fighting for the same people,” he said. Paul Stanford, Northern Colorado president of CoBiz bank, said relationship management is where his company finds a gap in available talent. Saying past generations of bankers worked their way up in organizations, he said it seems that today there’s less desire to learn the business from the inside. “They want to move right up before learning the business,” he said. Replacing seasoned bankers who retire is a big issue for the industry. Bateman said banks in earlier years could tap into pools of workers trained by the big banks, but now those banks are based someplace else. Bryan Watkins, Northern Colorado market president for Elevations Credit Union, said that bankers need to get more on top of workplace trends. “More is being required of employers,” he said. “Employees want to work from home, have quality time off” and other benefits that traditionally bankers haven’t offered. And the nature of the the banking job has also changed, Wood said. “Banking is moving toward providing a concierge to guide customers” through whatever process they need. Specialists will work behind the scenes to process loans or handle deposits, but customers will have one point of contact in a concierge — which changes the type of person banks need to hire. The bankers believe that conditions are good for the industry right now, but all have encountered difficult economic conditions in the past and are wary of what could be coming. Wood said competition can also affect the length of term of a loan. Best practices may suggest a shorter term, but a competitor may be offering a longer term. “Short term decisions can be made without remembering long-term impacts,” he said. Bateman concurred. “We’ve got senior lenders who have never had to stress test,” he said. “We need to be cautious about the boom,” he added, citing industry wisdom about bank failures happening during the bust times because of decisions made in the boom times. Within the commercial arena, bankers are experiencing most customer activity in residential, particularly multi-family residential. They said single-family residential construction is mostly financed by large national developers who have their own access to capital. Ramirez said that lending for retail can be tricky. “Retail has to be Amazon-proof” before his bank is interested in lending, he said. Wood said the demographics of who is borrowing has changed. Today’s borrower is mostly 60-plus in age and often is helping out sons and daughters who don’t have equity. Watkins, like others at the table, was not overly concerned about an economic downturn. “Credit quality is always on our mind. We’re looking to make quality loans (regardless of economic conditions,)” he said.